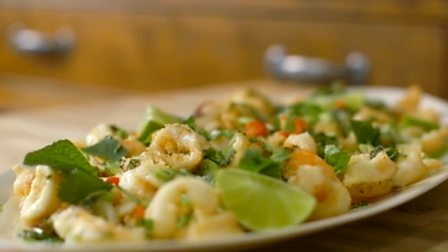 A quick fun way to serve delicious seafood in crisp batter with a fresh, spicy salsa dressing. Put the squid and prawns into a bowl and mix them well with the soy sauce, Shaoxing rice wine (or dry sherry), sesame oil and the juice of one lime, then set aside while you make the salsa. For the salsa, put half the herbs and all the other ingredients for the salsa into a small food processor and blend to a fine purée. To make the tempura batter, add the cornflour to the squid and prawns and mix well to coat – it will be very sticky. Carefully place the seafood into the fat in batches and fry for two minutes, or until just cooked through and crisp. Remove with a slotted spoon and drain on a plate lined with kitchen paper. To serve, put the fried tempura onto a platter then drizzle over the dressing, scatter over the reserved herbs and finish with the spring onions and chopped chilli. Cut the remaining lime into wedges and place alongside.